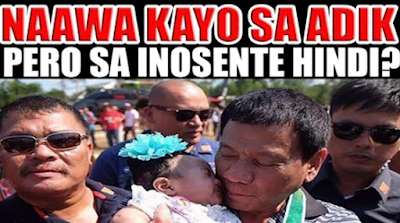 Home Article News President Duterte: 77,000 Innocent Victims vs 10,000 Addict Criminals? Which one will you choose? President Duterte: 77,000 Innocent Victims vs 10,000 Addict Criminals? Which one will you choose? "If you count the victims, according to the victims of drug addict, it's 77,000 innocent victims! Now you give me a number about 10,000 drug addict criminals dead." Yan ang matapang at galit na statement ni Pangulong Duterte laban sa mga kritiko na bumabatikos sa kanyang war on drugs. Dagdag pa nang pangulo, para sa mga pulis na nakakapatay sa kanilang police operations against drugs, they will have the full support of the president. So the question to all of the "dilaw ang utak", Which one do you choose? The life of the criminals or the life of the law abiding innocent people? It's either us or them.